Hey there. 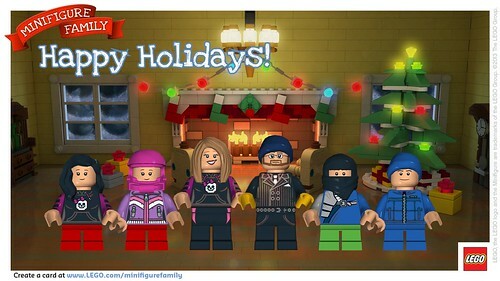 Check out this awesome LEGO Minifigure Family postcard that I created at MiniFigureFamily.com. I have been playing with LEGO blocks for as long as I can remember and I am glad to see that they have expanded to more than just blocks. As popular as they are, I love that they are still a simple concept with limitless creative possibilities. Even as a 30 year old, I still have fun creating using LEGO blocks. I still find myself creating stuffs with my young son. Before I know it, more than hour has passed and we're still having fun and building. Creatin with LEGO blocks is just plain fun. Even in a virtual world. The above postcard was created in just a few minutes and I was able to get the whole family involved! Let me tell you just how easy it is to create your own LEGO minifigure postcard. Once your family members are in place, you can choose the scene where you would like your minifigure family to stand in front of. There are about 12 options to choose from. Anythin from a beach, to the woods, to the north pole. In the end, we all decided that a picture in front of a cozy fireplace would suit us best. It only took a few minutes to create the postcard and even though the process was short, a memory was created. The holidays are times where time spent with love ones create long lasting memories. Even though we hung around together and played with LEGO minifigures online, that moment has now been immortalized with this postcard. Create your memorable moment with your family with this fun and easy LEGO creation. Later! I would love to see Monsters University with my kids. I love the cute characters in this movie for my kids. I like the Star Trek casting clip. I would like to win The Lone Ranger. I would love to win The Little Mermaid for my granddaughter. Thanks! Behind the scenes from White House Down was interesting. I would like Weeds or Grown Ups 2. I'd want Despicable Me 2. I like The Little Mermaid - Diamond Edition and I liked seeing MonstersU clip. My favorite behind the scenes bit was Chris Pine's description of Benedict Cumberbatch's very precise, in-character movements as Khan in "Star Trek: Into Darkness" -- and the fact that Benedict didn't even know who he'd be playing when he signed on. I'd love to win the "Man of Steel" or "Weeds: Complete Collection" blu-ray -- thanks! I liked the Star Trek clip...and would probably want that movie.